IR quarterback Tyler Bowen looks for room to run during last Friday’s game against Polytech. Of the 43 players listed on the Indians’ roster only 23 dressed for the season finale against Henlopen Conference North Division champion Sussex Central on Thursday, Nov. 8. 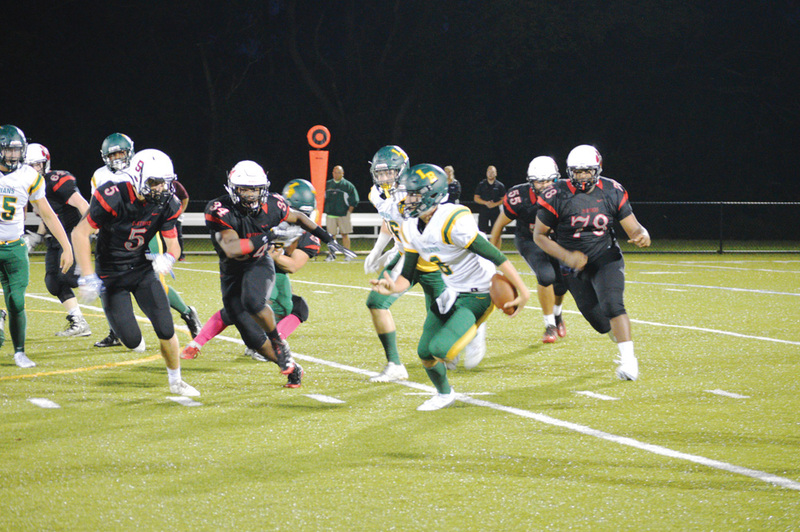 With more than 10 starters reportedly out for the game, the Indians had the unenviable task of taking on the Golden Knights, who were solely focused on handling their business before the DIAA state playoffs commenced. That business was handled — easily. Central defeated Indian River High School 63-0. “They’re a good team, and we wish them the best of luck in the future,” IR coach Phillip Townsend said after the game with the Golden Knights. “I think they have a really good chance to make a run at the Division I state championship. Central flexed its proverbial muscles from the jump, running out to a 49-0 lead through the first two quarters. The second half was played by their backups and junior varsity team. For the game, Central picked up 425 yards on just 29 plays, with 25 of those plays coming on the ground, for 313 yards. Quarterback Isaac Barnes — one of just 11 seniors on the Central roster — completed 3 of 4 pass attempts, for 112 yards and a pair of touchdowns. Quite possibly more impressive than the offensive numbers put up by the Golden Knights was how stingy their defense was in the game. IR managed just 45 yards on 40 plays. That’s not a misprint — 45 yards total. Senior Reshawn Turner had 23 stripes on 11 carries, while sophomore Derek Bellemare added 27 on just three totes. Sophomore Reagan Dunn — the Indians’ fourth quarterback of the season, due to injuries — was 1-of-7 for 17 yards, his lone completion going to senior Kashid Waples. It was Waples’ first catch of the year. Central’s dominance this year cannot be overstated when looking at their season in totality. The win over IR was the Golden Knights’ seventh shutout win of the season and third in a row (a streak they’ve accomplished twice now this year as well). They allowed a total of 41 points in 10 games — good for 4.1 per game. Furthermore, in those 10 games, now 9-1 overall, they have scored 332 points — or 33.2 per game. Central’s efforts during this season have earned them the No. 3 seed in the DIAA Division I playoffs, which open this weekend. They will play host to No. 6 seed Appoquinimink. As for the Indians, the only clear positive they can take from all these injuries this year is that their young players were able to have a baptism by fire, so to speak. Learning on the job, with little to no experience, against these caliber of teams may show them how much more work they have to put in during the off-season if they want to get to that next level. “That’s kind of what I told them,” Townsend admitted of his end-of-game meeting. “A lot of kids talk about being good. You can’t be a pretender. You gotta just go out there and do it. Be a contender. Show everybody that you want to get in the weight room. The Indians ended their season with a 3-7 record. Despite their final result, the Indians were only shut out twice this season. They scored a total of 150 points in their 10 games, which averaged out to 15 per contest. Defensively, IR allowed a total of 419 points — or 41.9 per outing. The Indians finished -20 in the takeaway department, with 33 of their own turnovers to their opponents’ 13. The team’s leading rusher this season was Turner, with 566 yards on 137 carries (4.1 ypc) and a pair of touchdowns. Angelo and Killen were the top two receivers for the Indians. Angelo hauled in 17 passes for 316 yards and four touchdowns. Killen, who was lost to injury in the Seaford game, caught 14 balls for 257 yards and two touchdowns. Defensively, IR was led by T.J. Moore’s 70 tackles. He also had an interception. Zach Schultz was credited with 57 stops and two sacks. JaQuan Floyd had 37 tackles and a pair of sacks as well. R.J. Rybicki had 35 tackles, an interception and a sack. Jodiah Morris picked up 33 tackles and a team-high four sacks. Freshman T.J. Burke had 27 tackles, and senior Jacob Grab had 23 stops.